To me, nothing epitomizes the food of Charleston, SC more than an oyster roast, and if you don't know anyone locally who will throw an oyster roast for you, then the best choice for you is to go to Bowen's Island Restaurant. I know there are lots of good Southern restaurants in Charleston, but honestly, I feel like if you are a tourist from somewhere else in the United States, a local, or a visitor from somewhere else in South Carolina, you gotta go to this place at least once, especially if you've never been to an oyster roast before. And even if you yawn because you've been to oyster roasts your whole life, Bowen's Island has great, local oysters that they grow locally, which makes the experience even better because the oysters are that much fresher. 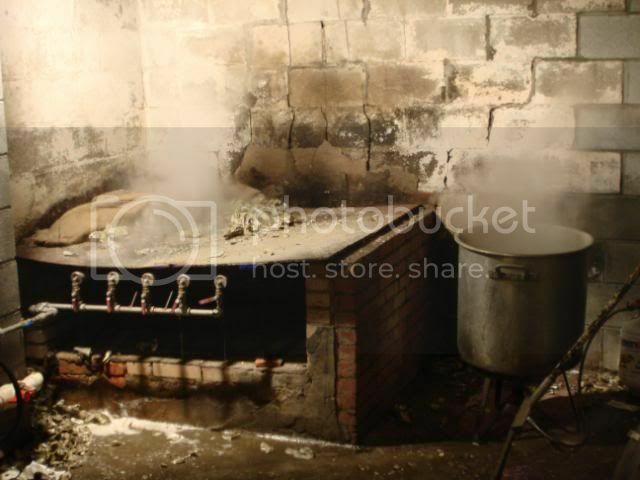 For those of you that don't know what an oyster roast is, look below at the second photo and explanation. Before I jump into the food, I will note one REALLY important thing: the wait at this restaurant is really, really long. Seriously. They open up at 5 pm - 10 pm, but if you don't come at opening on the weekends, be prepared to wait at least an hour to an hour and half on the weekends before you can even reach the cashier to get a table - it is really popular with the locals! I heard the wait is not nearly as bad on the weekdays, but I haven't independently confirmed this yet. 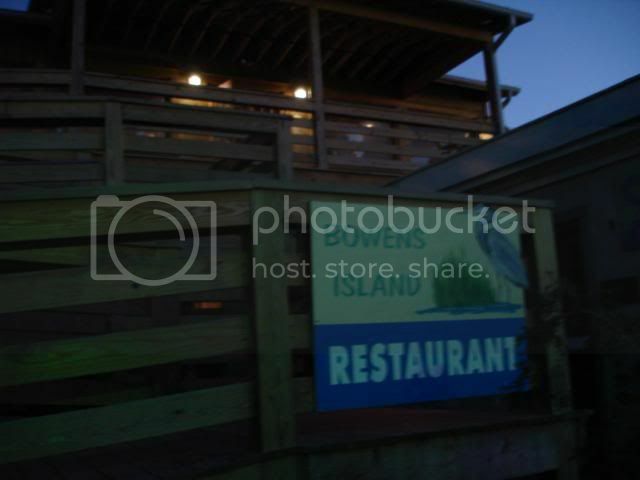 1) If you look at the above photo, the restaurant is split into two floors - the ramp leads up to the top floor, where you order and can also sit down (there are also larger tables next to the actual oyster roast area on the bottom floor). Go and line up - if you are lucky, the line will still be inside the restaurant. And if not, be prepared to be waiting on the ramp outside. 3) When you get to the front of the line, you will finally be able to order your food/drinks, pay the cashier, and give them your name (if you ordered the fried seafood). They do accept credit cards now (they only accepted cash before, but the restaurant has changed its policy now). If you are ordering oysters (which you should, why else would be going, anyway?! ), the cashier will give you a plastic tag, which indicates how many oysters (or all you can eat) you ordered. The cashier will also give you some cotton towels and oyster knives to crack open the oysters, just in case you didn't bring your own. 5) Walk back to your table and enjoy your oysters! Btw, one last tip: if you are a large party and ordered all you can eat oysters, you might want to sit on the bottom floor, that way, you won't have to walk up and down from the oyster roast area to your table multiple times - it is a pain to walk up the stairs and open the door with a tray of oysters, trust me. The tables downstairs also have a built-in bucket area in the center of the table, which makes it more convenient for everyone to toss out their oyster shells. If you sit upstairs, you might have to find a plastic bucket for your table to toss your empty shells into. So this is the oyster roast area that Bowen's Island has on the bottom floor. Pretty simple, but oh, the deliciousness that comes out! 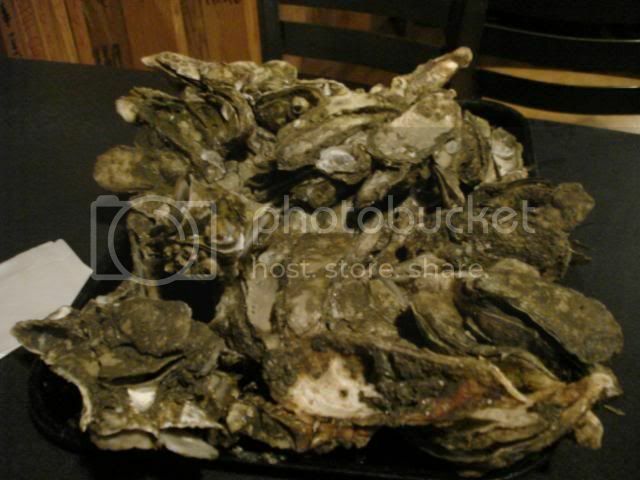 =) Fresh, locally harvested oysters are constantly being tossed on the grill and steamed until they are cooked. Oysters roasts only exist in the southeastern part of the United States, and they are a delicious way to enjoy oysters if you like seafood. 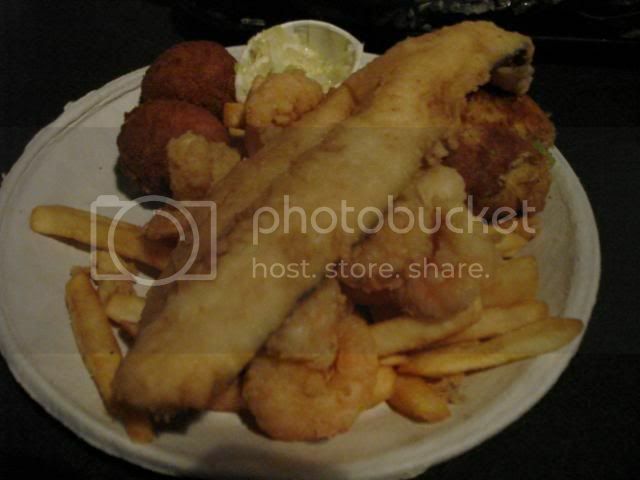 Lastly, a photo of the regular sized fried seafood platter we ordered. If I remember correctly, you can also order the fried fish/fried shrimp/crab cakes/french fries/etc. on its own. The large seafood platter is pretty much the same as the regular, except they have one extra fried fish piece, I think. They also offer a small little cup of cole slaw...I kind of wish they gave more of the cole slaw! All the fried foods were fresh and good - not great though...you really should be going for the oysters, if you come here - but it provides a nice variety in between eating all those oysters. I can't yet say that Bowen's Island is the best place for an oyster roast in Charleston (there is another famous place, The Wreck of Richard and Charlene, that I definitely want to try in the near future, but they don't have the selection of fried foods that Bowen's Island offers), but even having been to a couple of local oyster roasts after moving to South Carolina (as well as the gigantic yearly lowcounty oyster roast Charleston throws in the winter), I thoroughly enjoyed my experience here, and suggest that everyone go at least once!